If you’re spending every weekend dragging people around bridal stores or doing wedding planning activities, you’re going to suffer from wedding burnout or drive everybody crazy – or both! Remember to make some fun plans with your partner and/or friends that doesn’t involve anything wedding related. Alternatively, hire someone else to do the chasing and planning so you can relax. Planning your big day is supposed to be fun, but there are always parts that don’t seem exciting or interesting at all, such as reading contracts and trying to narrow down your guest list. If you start to find this process is making you snappy or grumpy, then it’s time to take a break and spend some time de-stressing. Perhaps a few trips to the gym or some yoga and meditation might be just the ticket to re-set your mood. Do you keep putting things off while your to-do list forever seems to be expanding? It’s sound like the opposite of what you would do if you had lots on your list, but procrastination is an example of feeling overwhelmed and not knowing where to begin. Firstly, take a well-earned break from wedding plans and secondly, break tasks up into manageable bite-size actions. Alternatively, hire some help. 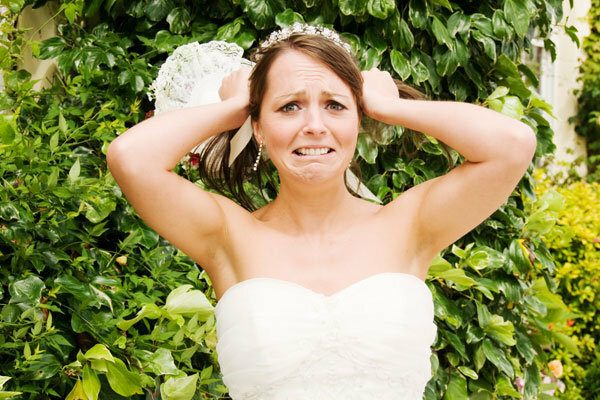 If you’re wedding stress is appearing in your dreams and you’re waking in a cold sweat because of wedding-themed nightmares, then it’s time to take a step back. If you’re also suffering from insomnia because you cannot switch your wedding brain off at night, you also need a break. Try getting away for a romantic weekend, free of planning to remind yourselves why you’re getting married in the first place.